There are plenty of ways to manage your information—and several ways to properly shred and dispose of documents and data too. Here, we’ll provide examples of improper document destruction policies, outline what media and information poses the greatest risks to businesses for data breaches, and help you eliminate gaps in your company’s information security. 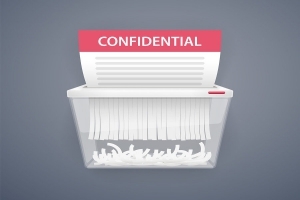 Use this guide to protect your employees, customers, and credibility by learning more about the proper ways to shred and dispose of documents and records. We’ll identify examples of improper document destruction policies & outline what media and information poses the greatest risks to businesses for data breaches. Would you like to learn more about proper data destruction and disposal? Check out these articles, infographics and more! Learn about the different types of shredding services, including mobile, off site, drop off, and ship ‘n’ shred shredding services. Find out which shredding service will work best for your home or business and the costs that are associated with them. While we may not be able to see it, the office products and electronics that surround us hold vast amounts of data. Use this article to get an in-depth breakdown on the best ways to properly destroy and dispose of your office equipment to ensure it can never be used against you again. Improper disposal of hard drives can have major impacts to a business. Between potential fines and damaging your reputation alone—there are plenty of reasons to ensure you properly shred and destroy your hard drives. To learn more about some of the top reasons, check out this article! Although hard drives and electronic media have come as a convenient tool to companies, there are serious implications for misuse and improper product disposal. Use this article to learn about the top hard drive mistakes to avoid, and how to prevent them with strategies like hard drive shredding or offsite device storage services. With cell phones and smartphones collecting more and more personal information, it is critical to properly dispose of them when it is time to retire the device. Find out how to securely destroy your old cell phones here. Heavy-duty, industrial-grade shredders are wildly expensive, and just renting one can be costly—so why pay for a rental just so you can do all the shredding work yourself? Here we explore other easy and popular alternatives to renting a shredder, including convenient mobile shredding, cost-efficient offsite shredding, and even community-benefiting shredding events. Document management helps businesses to organize their information and documents from the moment of their creation up until the moment they’re destroyed. Use this article to get more information on creating an efficient document management plan and to help you find services to streamline the management process.